It’s well known that our elders do less well than younger folks after injury. The number of complications is higher, there tends to be more loss of independence during recovery, and mortality is increased. This is not only true of high energy trauma like car crashes, but also much lower energy events such as a fall from standing. Rib fractures are common after falls in the elderly and contribute to significant morbidity if not treated adequately. Traditionally, they are identified through a combination of physical exam and chest x-ray. Unfortunately, only half of rib fractures are visible on x-ray. It falls to the physical exam to detect the rest. A group at Beth Israel Hospital in Boston explored the utility of using chest CT in an attempt to determine if this would result in more appropriate and cost-efficient care in the elderly. They performed a retrospective study of 3 years of their own data on patients aged 65 or more presenting after a mechanical fall and receiving a rib fracture diagnosis. Imaging was ordered at the discretion of the physician. A total of 330 patients were elderly, fell, and had both chest x-ray and chest CT obtained. This was a very elderly group, with a mean age of 84 years! Conclusion: use of CT for rib fracture diagnosis resulted in a few more admissions, but no change in hospital resource utilization, complications, or mortality. Bottom line: Hmm…, read the paper closely. The authors conclude that more patients with CT-only identified rib fractures are admitted. But compared to what? Unfortunately, patients without rib fractures on CT. What about comparing to patients who had fractures seen on chest x-ray too? If that number is the same, then of what additional use is CT? Identifying a few incidentalomas? Given that there is no change in the usual outcome measures listed here, it doesn’t seem like there is any additional benefit to adding CT. And I can see a lot of downsides: cost, radiation, and possible exposure to IV contrast. In my mind, there is still nothing that beats a good physical exam and a chest x-ray. Skip the CT scan. And don’t even think about ordering rib detail images! That’s so 1990s. And even if no rib fractures are seen on imaging, physical exam is the prime determinant for admitting your patient for aggressive pain management and pulmonary toilet. Reference: Chest CT imaging utility for radiographically occult rib fractures in elderly fall-injured patients. J Trauma ePub ahead of print, Jan 23, 2019. Don’t Repeat Trauma Activation X-rays!! The decision tree on this one is very simple. There are two factors in play: what do you need to see, and how hard is it to see? The natural reaction is to discard the original image and immediately get a new one. It’s so easy! 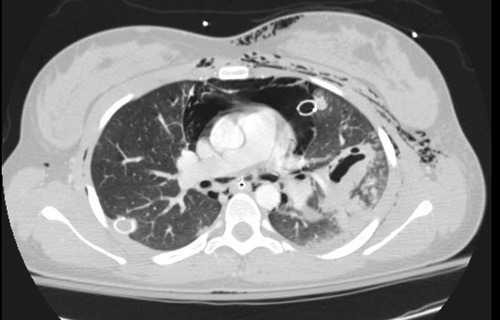 Plus, the techs will take heat from the radiologist because of the suboptimal image. But take a look at this example of a “ruined” chest xray. It’s just the patient’s hand! You can still see everything that you really need to. 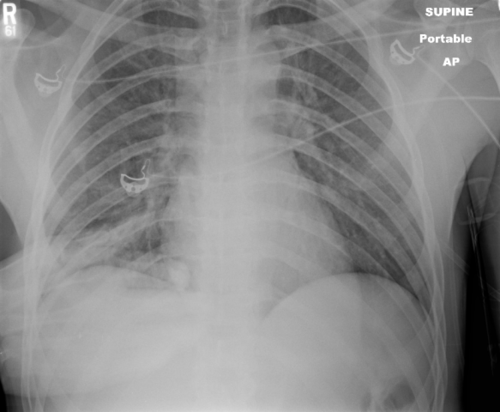 Tension pneumothorax is an uncommon but potentially lethal manifestation of chest injury. An injury to the lung occurs that creates a one-way valve effect, allowing a small amount of air to escape with every breath. Eventually the volume becomes so large as to cause the lung and mediastinum to push toward the other side, with profound hypotension and cardiovascular collapse. 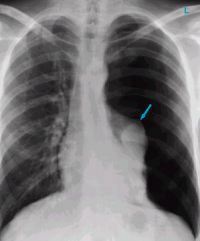 The arrow points to the completely collapsed lung. Note the trachea bowing to the right. As soon as the diagnosis is made, the right thing to do is to “needle the chest.” A large bore angiocath should be placed in the second intercostal space, mid-clavicular line, sliding right over the top of the third rib. The needle should then be removed, leaving the catheter. 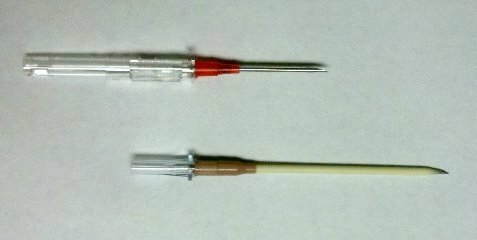 The traditional large bore needle is 14 gauge, but they tend to be short and flimsy. They may not penetrate the pleura in an obese patient, and will probably kink off rapidly. Order the largest, longest angiocath possible and stock them in your trauma resuscitation rooms. The top catheter in this photo is a 14 gauge 1.25 inch model. The bottom (preferred at Regions) is a 10 gauge 3 inch unit. Big difference! The final tip to treating a tension pneumothorax is that a chest tube must be placed immediately after inserting the needle. If the patient is on a ventilator, the positive pressure will slowly expand the lung. But if they are breathing spontaneously, the needle will change the tension pneumothorax into a simple open pneumothorax. Patients with other cardiovascular problems will not tolerate this for long and may need to be intubated if you dawdle.